Scientists who fitted heart rate-monitoring tags to Arctic narwhals have discovered a strange paradox in how the animals respond to threats. When these tusked whales are frightened, their hearts slow, but at the same time they swim quickly to escape. Scientists say the response could be "highly costly" - because they exert themselves with a limited blood supply. They raise questions about how the enigmatic "unicorns of the sea" will cope with increasing human intrusion on their Arctic habitat. Historically, narwhals have not come into contact with much human disturbance, because they live mainly hidden among Arctic sea ice. But in recent decades, as the ice has declined, this is changing. "Shipping and exploration for oil and gas is moving into the narwhals' world," said lead researcher Dr Terrie Williams, from the University of California, Santa Cruz. Having developed technology to study the physiology of dolphins at her home institute, she explained that her collaborator on this study - Dr Mads Peter Heide-Jorgensen, from the Greenland Institute of Natural Resources - contacted her to see if her tags could be used on wild narwhals. "His research allowed him to work with hunters; instead of the animals being killed, he releases them with satellite tags," Dr Williams explained. "So this was an incredible opportunity to look at the biology of a deep-diving whale." The tags she developed incorporate a heart monitor with depth and acceleration measurement, as well as a satellite tracking device. "We're riding the back of a narwhal for days with this technology and it's just astounding to me," she told BBC News. 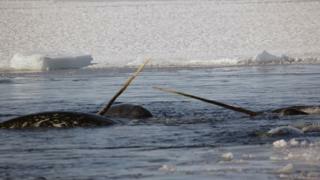 The researchers worked with the hunters to find narwhals already entangled in nets. They released each animal, attaching a tag to its back with a suction cup, before pushing it into the deep water of the East Greenland fjords. "The very first heart rate measurement was - as you would imagine fairly high," recalled Dr Williams. "When the animals were just sitting there, it was about 60 beats per minute - about the same as our resting heart rate. "But the moment those animals took off, their heart rate immediately plunged down to three or four heart beats per minute - 15 to 20 seconds between each beat." At first, Dr Williams and her colleagues thought the animals might be showing a proverbial "rabbit in the headlights" response - by freezing and waiting for the threat to pass. "But when we looked, they were swimming just as fast as they ever do," said Dr Williams. "So you have these two opposite things happening at exactly the same time, heart rate is really low, and that is superimposed on an exercise response. It was crazy." This reduction in heart rate, the scientists suggest, could help explain some whale strandings. If animals are moving quickly to escape a threat, but their heart rate is very low, this could deprive their brain of oxygen and leave them disorientated. Long periods of this low blood flow and reduced oxygen supply to the brain might even cause permanent damage. "I think we've identified a real physiological challenge here and we're going to pursue the details of that to see if we can figure out what's going on," Dr Williams said. For narwhals and other Arctic marine mammals, the discovery highlights some worrying implications of shipping and mineral exploration moving into increasingly ice-free Arctic seas. "When you think of the escape response and new kinds of threats from ships and other noise, you really have to move in a cautious way," Dr Williams added. "We may have to safeguard certain areas, if we want to have the unicorns of the sea still living."